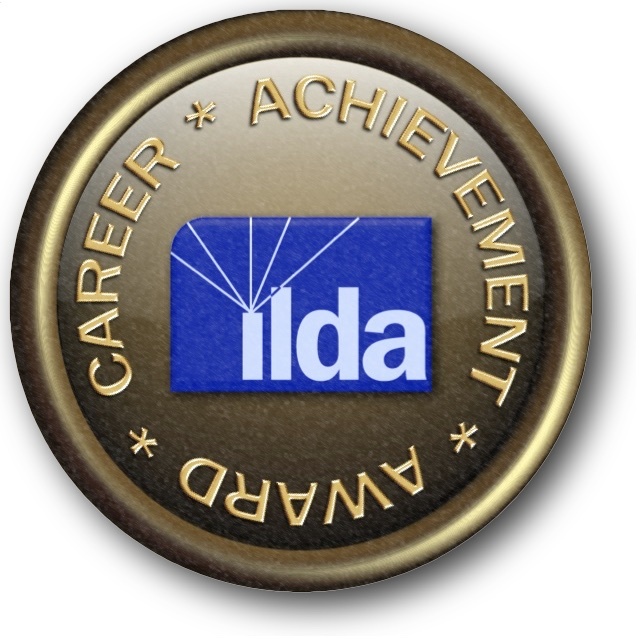 The Career Achievement Award is ILDA's highest honor. It honors "an exceptional individual with a distinguished history of achievement in the laser display industry." • Those who worked to improve ILDA and the laser display industry. From 1989 to 2007, Members nominated candidates and a three-person panel made the final selection. Beginning in 2009, Members nominate candidates, and then a few months later vote on the nominees in order to choose each year’s winner. Recipients are listed below. Click the person’s name for more information about a recipient. Since 2009, this information usually comes from the nominating statement. The name "Laserium®”" is synonymous with laser shows. Ivan Dryer is the man behind Laserium -- the man who brought laser shows to mass audiences. Dryer was a filmmaker in the early 1970s. On one project, he worked with Dr. Elsa Garmire, a Cal Tech physicist interested in laser light art. (She had previously worked with other artists on special event laser shows.) The resulting film, Laser Image, did not have the pure colors and shimmer of laser light. So Dryer had the idea of bringing the Cal Tech laser to Los Angeles' Griffith Observatory. He, Garmire and Dale Pelton formed Laser Images, Inc. to create planetarium laser shows. The rest is history. The first Laserium show opened to the public on November 19, 1973. It was the first ongoing laser show (not part of a special or one-time event), and it spawned an industry. Dryer's Laserium shows went on to be played in 46 cities worldwide, and were viewed by over 20 million people. Other companies sprang up to do planetarium shows, and laser imagery then spread to other venues such as concerts and corporate shows. Laserium was the longest running theatrical attraction in the history of Los Angeles. It continued until the Griffith closed for remodeling on January 5, 2002 -- a remarkable 28-year run. Dryer is universally recognized as the father of the laser show industry. His selection by ILDA as recipient of the first Career Achievement Award underscores his unique place in the history of laser displays. Seiji Inatsugu, one of the founders of Laser Media, Inc., is the recipient of ILDA's second annual Career Achievement Award for outstanding contributions to the industry. Inatsugu, who received the award at the 1990 General Meeting in Bradenton, Fla., was hailed for a long list of technical contributions to the laser industry, "a veritable encyclopedia of fundamental innovations," said Ivan Dryer, head of Laser Images and ILDA's current president. Inatsugu, who holds a doctorate in physics, began his fascination with lasers in the late 1960s when he made his own lasers and blew the glass for the tubes. His technical accomplishments at Laser Media include the following: the development of galvo-based beam switching, now a fundamental laser show technique; the development of stable scanner amplifiers that paved the way for complex galvo-scanned images; and the conceptualization of Digital Graphic Image Generation, leading to the development of the IMAGEN computer and ZAP software. In accepting the award, Inatsugu urged the industry to prepare for a nev era that focuses on small but steady improvements in quality. "The book of our industry is not finished. Perhaps Chapter One of the book has been written. It is about the formative years of the industry. We are going to write Chapter Two together. That will be about the growth and maturity of the industry." • "To engineers and technicians: it is no longer possible to make leaps and bounds in technical progress as was done in my days. Do not let it discourage you because the industry still needs to solidify its technical basis. • "To those who are in management... although short term profit may be realizable by cutting costs in the areas of research and development, I envision that quality in products and services you provide will make your organization successful. Without technical innovation accompanied by creative vision, the prospects for such an organization will be dim. • "Technological progress depends on the technologies and components made available to us by suppliers, such as lasers and galvos. Without their improvement, there is a limit in this industry's technological progress." Floyd Rollefstad, president of Laser Fantasy International, received ILDA's 1991 Career Achievement Award honoring a lifetime of technical and artistic achievements. Rollefstad was honored for a series of almost single-handed technical achievements that have significantly advanced the laser display industry, including: 3-D laser graphic projection techniques, acousto-optic RGB technology for full-color graphics projection, and several unique fiber optic effects. In accepting the award, Rollefstad said he counted himself to be fortunate, because "not too many people get to participate in the birth of an industry. Artistically, we have incredible opportunities. We are the first people to ever use the amazing power of the laser to do artistic things." In addition to his pioneering technical work, Rollefstad was also honored for bringing educational laser display programs to more than 1,500 high schools across North America. "We're very proud of our education shows," said Rollefstad, whose company was among the first to produce full-length educational programs using laser displays. Educational shows include "American Dream," an historical program, "Learning to Fly," about aviation, and "Listen to the Whales," which covers ecology. Rollefstad began creating laser shows soon after obtaining his masters degree from the University of North Dakota in 1977, the same year he cofounded Laser Fantasy. After producing shows in Chicago and Minneapolis, his company came to the West Coast in 1980 to perform in Seattle at the Pacific Science Center, where it still performs today. The company is headquartered in Bellevue, Wash.
One of Laser Fantasy's best known works is at Washington state's Grand Coulee Dam, where laser images thousands of feet across tell a nightly story of the area's natural history. The show premiered in March, 1989 and runs during summer months. It uses 70 watts of laser power and sophisticated graphics projectors that produce full-color displays. Laser artist Jennifer Morris was honored with ILDA's fourth annual Career Achievement Award in recognition of over 15 years of ground-breaking work in the laser display field. Morris, a founder and former president of Image Engineering Corp. (IEC), made laser history in 1977 when she pioneered the first use of representational laser graphics in "Lovelight" The show, which premiered at the Boston Museum of Science's Hayden Planetarium, also broke new ground with its use of a highly-automated control system. "IIlumagenesis," laser effects for six dancers, featured in "Enter the Night," a revue currently running at the Stardust Theatre in Las Vegas. Morris has also directed the development of software tools at IEC and maintained decade-long relationships with such clients as IBM and the Meadowbrook Music Festival. When it comes to laser design, Morris says she prefers non-representational imagery. "I think it makes the best use of laser light A laser isn't film or video. A laser is its own kind of creature." Before launching IEC, Morris directed laser programs for the Aspen Design Conference, Chrysler and General Motors. She was also involved in electronic music and video graphics. Her independent work has been shown in London, Copenhagen, Geneva, Montreal and Boston. She received a Bachelor of Arts degree from Kirkland College, NY, where she concentrated in multimedia design. Robert Mueller, executive vice president and art director of Lightspeed Design, received ILDA's fifth Career Achievement Award in recognition of his thirteen years of contributions to the industry. Mueller literally worked his way up from the bottom of the laser display field, starting as a ticket-taker for a laser show in St. Paul, Minn., in 1980. Under the employ of Floyd Rollefstad, the founder of Laser Fantasy International and the 1991 recipient of ILDA's Career Achievement Award, Mueller switched paths from studying architecture at the University of Minnesota to become a top artist, programmer and art director. In addition to his artistic achievements, Mueller helped define display software developed by Aura Technologies and Laser Fantasy. He also pursued techniques needed to create digital and analog polarized 3D stereoscopic projections. After working at Laser Fantasy since 1980, Mueller became one of the founding members of Lightspeed Design in 1992. Under Mueller's direction, Lightspeed's artistic team recently won a string of awards in the 1993 competition for Outstanding Laser Displays. A winning trade show installation for Nintendo (hardware by Laser Fantasy) included seven scanner pairs that provided 360-degree coverage of a 50-foot dome. Another Nintendo production included 3D laser graphics visible with polarized glasses and laser-projected video imagery. Mueller's "Juggling Clown" was also honored with first-place in the Graphic Animation category. The piece featured precomputed morphing animations on spline-interpolated real-time paths. "I was spellbound and mesmerized the first time I saw a laser," said Mueller, recalling when he saw a laser at the age of 13 in a science museum. "I believe there is something in all of us that is attracted to light. Perhaps there is an exponentially greater attraction to laser light." In regard to his work, Mueller says he is never satisfied with a business-as-usual attitude. "I have an innate desire to take things to the next level. If I have an idea and I don't implement it, I don't feel I've accomplished what I've wanted to do." In addition to enthusiasm and dedication, Mueller believes the next essential ingredient for a laser show producer is the ability to surprise the public. "Audiences need to see something new, something that takes them by surprise. That's our goal; to create something so intrinsically interesting it gets people's attention." Patrick Murphy, as founder and 15-year president of Pangolin Laser Systems, played a key role in making it possible for just about anyone to create affordable, professional-quality laser shows. Murphy was a pioneer in laser computer graphics. His first computerized laser graphics were done in 1979, using a mainframe computer at Oberlin College. In 1981 he earned a B.A. degree in Laser Art and Technology. For the next five years, he continued to improve his software. In 1986, Murphy founded Pangolin Laser Software to sell his Amiga-based Laser Show Designer program, the first laser software that worked like standard computer graphics paint programs. In 1988, he and William Benner began their close collaboration on continually-improved Lasershow Designer versions. Murphy primarily handled Pangolin business functions and LD user interface programming, while Benner worked on advanced LD software programming and on the QuadMod hardware boards. Lasershow Designer was both a technological and artistic success. It won more awards for Pangolin and its clients than any other laser software and became a worldwide market leader. Murphy was a strong supporter of ILDA, working to create standardized equipment and shows. The widespread use of ILDA-compatible projectors and interchangeable shows demonstrates the degree to which this vision was realized. He was on the ILDA Board of Directors from 1994-1996, was elected ILDA President in 1995, and served as ILDA Airspace Issues Coordinator from 1996-1999. In November 1995, one month after Murphy was elected ILDA President, the FDA shut down all outdoor laser shows in Las Vegas. For the next three years, Murphy and other key ILDA members worked with regulators to protect the right of laserists to do outdoor shows. This effort was eventually successful — Murphy even wrote some of the regulations and forms used by the government. For his work, Murphy was awarded an ILDA Certificate of Commendation, and received an Award of Recognition from the “SAE G-10” aviation safety committee. Murphy was one of the three inventors of an entirely new style of laser display, raster graphic frames. He and Benner were co-winners of three ILDA Technology Awards and two Brewster Awards. Murphy also won an ILDA Technology Award for his renumbering algorithm, and two ILDA Artistic Awards for his own laser art creations. Inspired by the music of The Beatles, Walt Disney’s “Fantasia”, Stanley Kubrick’s “2001: Space Odyssey”, and a host of cultural events of the 1960s, Doug McCullough began creating psychedelic light shows for rock concerts in 1968. His first use of coherent light was in 1970 when he created lumia effects with a Helium-Neon laser in a multi-media performance with avant-garde electronic musician Morton Subotnick. In the mid-1970s, he formed Audio Visual Imagineering (AVI) as a sole proprietorship. In 1978 he first used high-power Krypton/Argon laser effects for multi-media presentations. In 1979, he fulfilled a lifelong ambition of performing light shows in a planetarium theater with the opening of “Laserdrive” at the Miami Space Transit Planetarium. Doug concentrated in the 1980s on developing the potential of laser light shows. One of the first uses of computer laser graphics was in 1982, when he introduced sequential laser animation in a planetarium light show titled “Visual Music”. He also pioneered thematically mixing abstract and graphic imagery in laser show choreography. Doug's shows at New York City's Hayden Planetarium (which included "Laser Floyd", "Laser Zeppelin", and "Laser Beatles") were legendary. In addition to planetarium shows, Doug worked on corporate meetings and special events, producing laser presentations for numerous high profile clients. For the corporate market, he developed generic laser “modules” for meeting openings, closings, speaker introductions, coffee breaks, product reveals, etc. At AVI, Doug innovated the extensive use of scanned mid-air beam effects with no “bounce” mirrors. This “look” of two lasers creating crisscrossing scanned mid-air beam effects has since become an industry standard. In 1987 Doug helped closely with the founding of ILDA; he served on the original Ethics Committee. Over the next 17 years, he and his team at AVI received numerous ILDA Awards for “hands-on” work in creative show production. In fact, in total number of ILDA Awards received, AVI has won more than any other company save one. In the early 1990s, Doug co-invented a 360-degree laser projection system for planetariums known as Omniscan. He also was the first to develop 3-D laser shows using the ChromaDepth technique. In 2000, Doug created the first all-raster laser show done with standard laser scanners. His ILDA Award-winning “Linea” was produced for Pangolin to demonstrate the then-new technique of TV-like raster scanned laser images. Early light artist who transitioned into lasers; founder of Audio Visual Imagineering. AVI was an early user of computer laser graphics and is #2 on the all-time list of ILDA Award winners (as of 2006). Bill Benner has revolutionized the laser show industry by creating technology that has made very advanced programming technology available to a mass, worldwide market at an affordable price. Bill's Pangolin technology has become the standard of the industry -- a yardstick by which all other programming systems are judged. Not resting on his laurels, he has continuously introduced new innovations into his programming capabilities -- which have in turn given users more powerful tools to produce more sophisticated presentations and increase the viability of laser shows in the global marketplace. Bill has also been one of ILDA's staunchest supporters -- contributing much in time and money. Bill's groundbreaking work as chairperson of the ILDA Technical Committee has been especially noteworthy in forwarding the use of new technology and establishing standards. President of Pangolin Laser Systems, recipient of numerous ILDA Awards, developer of advanced software and hardware systems, and a strong supporter of ILDA's work. (Due to a numbering change, there were no awards called “2008 ILDA Awards”. The awards went directly from 2007 to 2009. Greg Makhov has almost 30 years experience with visible lasers, building laser display equipment, and performing laser lightshows. He also worked in the Projection/Special Effects Dept. at Epcot for five years, maintaining then rebuilding the laser gear used in the nightly laser show. Greg is also strongly involved the area of laser safety. In this regard he has published several papers and he participates in the International Laser Safety Conference. He consults regularly for Rockwell Laser Industries (Cincinnati OH) as a Laser Entertainment Safety Instructor. He also consults for other laser display companies, teaching laser safety as well as basic laser principles. Greg has been chair of the ILDA Safety Committee since its inception in 1987. He has provided invaluable service to ILDA in the area of safety, as well as in hosting and supporting conferences and other ILDA activities. Greg Makhov has made technologically sound, affordable laser equipment available to a many, many individuals and companies in this business -- giving many their start in a successful manner. He has been an educator -- literally teaching courses in laser safety. He has been a tireless proponent of the safe use of lasers for display and has been instrumental in conferring with the FAA when issues (and misunderstandings) about the use of lasers have threatened our industry. Greg has been a long-time supporter of ILDA -- volunteering much time, effort, and money for ILDA conferences and activities. Greg's company, Lighting Systems Design, Inc., has been presenting a wide variety of laser shows since the early 1980s -- growing to the point of producing major multi-media spectaculars such as the opening of Lincoln Financial Field for the Philadelphia Eagles on Monday Night Football (to rave reviews!). President of Lighting Systems Design Inc., tireless proponent of the safe use of lasers. ILDA Safety Committee chair since its inception. A strong supporter of ILDA's work. Dipl.-Ing. (FH) Lothar Bopp founded and leads one of the major players in the laser show industry. It is a company which is active in more than 65 countries and which is called by independent market analysts, like the economic scientist Prof. Dr. Hermann Simon, the market leader in its industry. With over 100 ILDA Awards his company leads the all-time ranking list of the industry’s most important award. No other company ever received more ILDA Awards than his team. With the first two letters of his first name and his last name, he formed the name of the company: LOBO. With his name he stands worldwide for excellence in both, high-end laser show equipment and show production services, be it for permanent installations or for shows on a rental basis. LOBO is one of the industry’s driving forces, an innovation motor, a creative think tank as well as origin and model for many other companies which entered the market much later. Lothar Bopp opened many new markets for the whole industry and lifted the appeal of lasers among entertainment professionals on a new level. LOBO has an astonishing fan base, not just among laser freaks but also among competitors. Even one of Lothar Bopp’s toughest competitors, Rüdiger Müller, founder of tarm had nothing but praise for LOBO company: "I know the market unlike hardly any other. In my opinion, no other company is fit to hold a candle to LOBO in the area of show laser technology." No doubt; without Lothar Bopp’s uncompromising commitment to technical perfection and unconventional approaches, the laser industry would be different today. Founder and leader of LOBO, one of the major laser light show companies. LOBO has won more ILDA Awards than any other company, and has been a strong supporter of ILDA's work. Steve Heminover has been working since the early 1970's with laser display, to make it a formidable alternative to conventional media. In 1975 he created LGRASS, an interactive computer language specifically designed to control laser displays. As the first high-end laser graphics workstation, LGRASS pioneered true 3D (1984), stereoscopy (1985), and full-color RGB control (1988). He was the first to introduce the concept of RGB laser projection systems in Europe, along with industry standards to support them. The company he founded and runs, Aura Technologies, has been a pioneer in providing laser "clip art", in addition to producing shows and installations. He is a founding member of ILDA, where he has been very active. As chair of the Technical Committee for its first six years, he helped develop and evangelize the first worldwide industry standards. He created the Advanced Technology Workshop. He served on the Awards Committee since its inception in 1988, helping create its rules and standards for excellence, and presenting as Master of Ceremonies for ten years. He served on the ILDA Board of Directors for eight years, and was elected ILDA President a record four times. A pioneer in laser computer graphics, who was heavily involved in ILDA's formative years. He served four terms as ILDA President. Laser Production Network was founded in 1968; Tom Harman has been president for 36 years. In that time, LaserNet has produced innumerable shows. He is famous for beam and aerial shows. LaserNet has repeat clients who demand his presence as no one can do a beam treatment as well as Tom. He won one of the early ILDA Awards in 1988 for one of his beam shows, and the 1998 LDI "Laser Display of the Year" award. In 2010, LaserNet became one of only four companies to complete the demanding "ILDA Professional" accreditation process, proving LaserNet's experience, laser safety training, and industry activities. Tom has a very strong history of support for ILDA. He was one of the original founders of ILDA and one of its charter members. He has maintained LaserNet membership in ILDA every single year without fail (one of only three members to do so over these 25 years). LaserNet hosted the ILDA Conference three different times: 1995, 2008 and 2010. In addition, the 2004 Conference at LDI in Las Vegas was co-managed by LaserNet's Christine Jenkin. So that is four Conferences that LaserNet has hosted and run. The brief space on this page does not permit a full listing of Tom's qualifications for CAA. Please visit a special webpage at www.lasernet.com/caa.htm to read more about Tom, including four letters of recommendation from industry leaders including last year's CAA recipient Steve Heminover. For Tom Harman’s CAA acceptance speech, see the 2012 winners page, and scroll down to the “2012 Career Achievement Award” section at the bottom. President of LaserNet for 36 years, especially well-known for beam shows, a Founding Member of ILDA, and 4-time host of ILDA Conferences (as of 2012; he hosted again for a fifth time in 2014). Pavol Kubosek studied physics at Comenius University in the Slovak Republic. He received a Master's degree in optics and quantum mechanics, and a PhD. in 1993 with a thesis in speckle interferometry. He was a researcher in the Slovak Academy of Sciences, where he published many papers in international scientific journals. Pavol's career in laser display began in 1995 with the establishment of Kvant. He has said that the beginning was difficult and it helped him learn a lot about business. With personal qualities of persistence, consistency and good leadership, Kvant helped bring high quality lasers with affordable prices to the market. Now production is oriented on many different laser projectors with a wide range of possible adjustments based on customers' wishes, as well as laser modules used in display and other industries. Kvant has been innovative by introducing such features as DMX projector control, control over USB connections, introducing DPSS lasers (in 2004), controlling large numbers of projectors easily via software, first diode-only full-color laser system, plug-and-play lasers for smaller clubs, and compact solid-state modules pumped by blue laser diodes (2011). Kvant products are distributed in 40 countries; the company employs 80 people and was a finalist in Ernst & Young's "Entrepreneur of the Year" competition in 2012. Pavol holds many scientific and technical patents, and utility models. He never forgets that success comes only with a lot of effort. Kvant continues to upgrade quality, and search for new solutions in their Research & Development department. Founder of KVANT Ltd., which helped bring high quality lasers with affordable prices to the market. Timothy Walsh graduated with a degree in Music Composition from the University of North Texas, and has always incorporated dance, film, and video into his compositions. While an undergraduate, he got his start in lasers in 1977, as a planetarium laserist for Laser Creations, Inc. in Texas. He also co-founded Brave Combo, a Grammy-winning band still going today. In 1985, Tim formed Laser Spectacles, Inc.. Since then he has performed and installed laser shows world-wide, from churches to raves, corporate meetings to outdoor festivals. Tim approaches laser shows as an artist, passionate about getting the right look and achieving his unique vision. To reach his goals, he began designing and building his own laser projection equipment. He envisions the ideal show as "Laser Synaesthesia" -- seeing exactly what one is hearing; to accomplish this, he uses the same audio signal to control both the loudspeakers and the laser scanners. Tim is a professional musician and composes "Laser Synaesthesia" pieces to accompany his performances on saxophone, clarinet, Irish pipes and accordion. Tim and Laser Spectacles have won over 28 awards, beginning with the first ILDA Awards in 1988 and continuing with First Place Awards in both 2011 and 2012 -- the only 1988 recipient still winning today. Other notable honors include "Best Laser Show" at LDI and a First Place International Festivals and Events Association award for "Best New Event.” Laser Spectacles was one of the first two companies to receive the designation "ILDA Accredited Professional Lasershow Company" in 2010. Tim joined the ILDA Board in 2006, and served as ILDA President from 2006-2011. Tim and his wife Helen hosted the very successful 2012 ILDA Conference in San Antonio, Texas, and he did this as one of the few sole-proprietor companies to have run an ILDA Conference. In 2013, Tim received the ILDA Outstanding Service Recognition Award, for his long and distinguished service to the association. About ILDA, Tim says: "I am thankful to have been a part of ILDA from the start; ILDA's network of support and inspiration aids me in accomplishing my goals. I feel part of a world-wide family of laserists." For Tim Walsh’s CAA acceptance speech, see the 2014 winners page, and scroll down to the “2014 Career Achievement Award” section at the bottom. Founding Member of ILDA, past President 2006-2011, Awards Committee chair 1993-2000 and 2006-present. His company Laser Spectacles has won 28 ILDA Awards, and is one of the first two "ILDA Accredited Professional Lasershow Company" Members. German laserist Dirk Baur started his career in 1989. From the beginning, he was into development of laser peripherals, drivers and power supplies. Very soon, the first galvo scanning systems came out of the workshop of his small company, which soon led to the legendary CATWEAZLE scanners. In 1996, Dirk became an ILDA Member with his former company, es-Lasersystems. In 1997 he founded MediaLas GmbH, and went further in developing hardware and software for laser entertainment purposes, such as LaserPainter software, super-fast MicroAmp CTi drivers, and many more. MediaLas received several technical and artistic awards for innovations such as the automated RGB color alignment tool of the Infinity show laser projector systems. Dirk owns several patents and trademarks, and has expanded his company to the industrial laser sector. Dirk was an ILDA board member from 1998 to 2000, and from 2005 to 2009. Between 2005 and 2007, he also served as ILDA President. In the year 2000, MediaLas joined forces with LOBO, to jointly host the 2000 ILDA Conference in Stuttgart. Pioneering German laserist, developer of innovative scanners and laser systems. ILDA Board Member, President, and co-host of the 2000 ILDA Conference. In 1980 Alexander Timofeyev graduated from the Moscow Power Engineering high school majoring in Optoelectronics & Lasers where he was engaged in scientific work. He subsequently published over 50 laser-related research works and has 12 USSR Certificates of Invention (patents), as well as international patents. In 1995 he began work in laser display, helping develop outdoor laser advertising using acousto-optics to create bitmap images. He received the highest award at the Brussels Salon of Innovations: Eureka 1996. Shortly after that, Alexander became the со-founder and Chief Manager of Laser Show Systems Company (Moscow), which had become the largest company in the field of laser show systems at that time. It was the first company in Russia to integrate latest technologies and ILDA standards to the show technology represented on Russian Market. In 1998 he began participating in the ILDA Conferences. In 2003 Alexander became co-owner and general producer of Orion-Art Production International. In 2009 he became owner and CEO of Orion-Art Multimedia. The company is now one of the leading Russian companies in the field of laser and multimedia shows. From the very beginning of his work in the laser display industry, he has been striving to improve the quality of laser graphics and animation. Orion-Art began submitting their works for the ILDA Awards in 2004. Since then they have won 47 ILDA awards: 28 of them are the first and/or second prizes in the Laser Graphics, Beams & Screens, Lasershows, and Multimedia Show categories. In 2008 he was elected as a board member of the International Laser Association (LAS-Russia). Until 2011 he was heading the LAS' Department of Applied Laser Technologies in display systems, advertising and show-business. He was the first in Russia to introduce mandatory laser safety training and certification of technical staff working with lasers at laser displays. The 2011 ILDA Conference in Moscow, hosted by Orion-Art, was acknowledged as one of the most interesting and successful in the history of ILDA, and gained a few new ILDA members from Russia. Alexander Timofeyev believes that one of the key areas of his work is introducing new products and ILDA standards to the Russian market, maintaining the principles of ILDA ethics in working with partners, and compliance with ILDA safety standards. For Dr. Timofeyev’s CAA acceptance speech, see the 2016 winners page, and scroll down to the “2016 Career Achievement Award” section towards the bottom. Head of Orion-Art Multimedia (winner of 47 ILDA Awards as of 2016), helping to improve Russian lasershows’ quality and safety, and host of the 2011 ILDA Conference. Alexander Hennig is well-known within the laser industry for helping build LOBO to a preeminent leader in laser and multimedia, and for his record-breaking number of awards. And he is well-known within ILDA for his long and influential service to help improve the association. In 1994 as a LOBO freelance artist he created a multimedia show for the 1250th anniversary of the city of Fulda, Germany. This won LOBO their first ILDA Award. And winning the award was one reason he was asked to become LOBO’s creative director — a position he held for 23 years. Under Alex’s leadership, LOBO received a record-breaking 162 ILDA Awards. No other company has come close to this, making Alex one of the most influential laser artists in our industry. One reason for this success is that Alex was careful to have a varied style both in his own works and in those of others that he supervised. This meant there was not a typical or repetitive “LOBO look” — their work was always fresh. Alex has represented LOBO at trade shows, and within ILDA where he has been very active. Alex attended 16 ILDA Conferences since 1997. He worked on the Awards Committee, and served on the ILDA Board of Directors from September 2010 until November 2016. During his three terms he especially championed international members, smaller companies, direct voting for awards and Board members, and the ILDA New Talent award. Alex and LOBO significantly supported ILDA by co-hosting the 2000 ILDA Conference in Stuttgart, and again in 2013 by hosting both the ILDA and the Laserfreak conferences in Aalen. The 2013 event is thus far the most heavily-attended ILDA Conference ever. In 2016 he left LOBO after a quarter-century to work as creative director for a non-laser company, Zweiplan, in Munich. This is an appropriate time therefore to honor Alexander Hennig for his laser career achievements as the all-time ILDA Award winner, and as a strong supporter of the International Laser Display Association. For Alex Hennig’s CAA acceptance speech, see the 2017 winners page, and scroll down to the “2017 Career Achievement Award” section towards the bottom. All-time ILDA Award winner as of 2017, three terms on the ILDA Board of Directors, two-time host or co-host of the ILDA Conference. Laser shows were first popularized by Laser Images Inc. through their “Laserium®” shows in planetariums. Laser Images’ Glenn Thomas pioneered the art of live performances of abstract laser imagery with music. During his 27(! )-year career as the senior laserist for Laserium® at the Griffith Observatory in Los Angeles from 1975 to 2002, Glenn performed approximately 12,500 live shows that both inspired and influenced those of us who followed in his footsteps. Laser shows were presented very differently during Glenn’s career. They were performed in the totally darkened environment of a planetarium theater with a single ion laser powering the innovative Laserium® projector. It had four X-Y scanner pairs and an extensive array of optical effects that even today have never been equaled. The original Laserium® shows consisted entirely of abstract laser imagery that was performed live. The laserist controlled all aspects of the image composition (such as harmonic frequencies, size, position, movement, color, optical effects, etc.) from a sophisticated console which was similar to an electronic music synthesizer — with a multitude of potentiometers, switches, and even joysticks. Glenn played the console just like a musical instrument and elevated Laserium® shows to become synonymous with visual music. And Glenn was one of the most renowned and accomplished laserists of this bygone era of live laser shows. He was a master of his instrument – like Yo-Yo Ma is to a cello. Laserium® founder Ivan Dryer, honored as the first recipient of the ILDA Career Achievement Award, remarked after one of Glenn’s performances that it wasn’t just entertaining but that it was a transformative experience. Pretty high praise! ILDA has published online Glenn Thomas' book “Laserium® Laserist: The Greatest Job on Earth. Pioneering performing live laserist, 27 years with Laser Images Inc. (Laserium®) and trainer of many other early laserists.